My experience at SXSW Interactive this week was marked by catching up with friends, a massive amount of networking, very little sleep, and some inspirational content, most notably the Billy Corgan/Brian Solis session about Corgan’s uneasy relationship with a music-buying public that (in Corgan’s view) uses social media to attack artists rather than support them. I provided real-time coverage of the session from my Twitter account, @davidjdeal; you can see how the discussion unfolded by following hashtag #EndofUsual on Twitter. Amid Corgan’s f-bombs and rants, a compelling theme emerged: artists need their audiences, but in order to prosper and grow, they cannot allow themselves to be led around the nose by the same people who call themselves their fans. 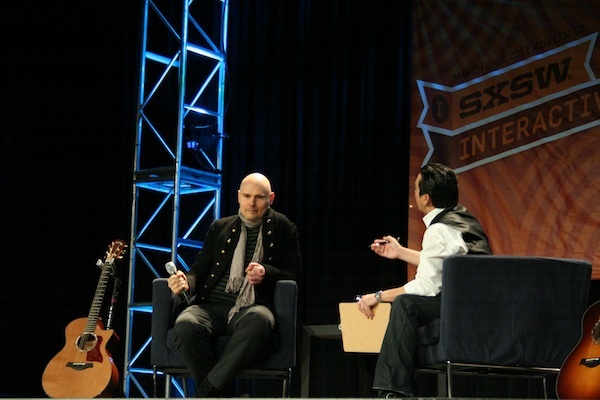 As Corgan said to a recalcitrant SXSW audience member, “I can’t survive by accommodating your Twitter feed with my music.” The Corgan/Solis session brings to mind a post I wrote in 2010, “Would ‘Exile on Main St.’ have survived Twitter?” in which I questioned whether the seminal but initially misunderstood Rolling Stones album would have held up amid the withering glare of Twitter had social media been around in 1972. The personal connections were, as usual, incredibly fulfilling, whether comparing notes about music and writing with my iCrossing colleague Todd Pruzan, laughing at life’s absurdities with Kristen Deye (a rock star who managed iCrossing’s presence at the event), reuniting with some of my former Razorfish colleagues and friends like Margaret Francis and Heather Gately, meeting Brian Solis and Scott Monty, hanging out with Jeremiah Owyang, seeing David Armano, meeting with Allen Weiner, or finding some time to relax over drinks with Cortney Harding and her husband Jeff Stokvis. People always trump interactive technology in my book. This entry was posted in Digital, Entertainment, Marketing, Music, Social media, Twitter and tagged American Express, Billy Corgan, Brian Solis, iCrossing, Jay-Z, SxSW, Twitter. Bookmark the permalink.